Not to be confused with the 1994 Italian film Il Postino: The Postman. The Postman is a 1997 American post-apocalyptic adventure film. It is directed by, produced by, and stars Kevin Costner, with the screenplay written by Eric Roth and Brian Helgeland, based on David Brin's 1985 book of the same name. The film also features Will Patton, Larenz Tate, Olivia Williams, James Russo, and Tom Petty. It is set in a post-apocalyptic and neo-Western version of the United States in the then near-future year of 2013, sixteen-plus years after unspecified apocalyptic events, starting with the breakdown of society through “hate crimes and racially motivated attacks (by) a militia-like group” led by Nathan Holn, progressing to war, followed by plagues, that collectively left a huge impact on human civilization and erased most technology. Like the book, the film follows the story of a nomadic drifter (Costner) who stumbles across the uniform of an old United States Postal Service mail carrier, and unwittingly inspires hope through an empty promise of a "Restored United States of America." 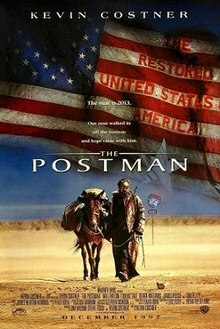 Released on Christmas of 1997 from Warner Bros., The Postman was a major critical and commercial failure, grossing a total of $17 million worldwide. In 2013, an unnamed nomad enters the Oregon flatlands, trading Shakespearean performances for food and water. In one of the towns, the nomad is forced into the ranks of the predominant militia in the area, known as the Holnists and run by General Bethlehem. When he escapes, the nomad takes refuge in a dead postman's mail vehicle. With the postman's uniform and mail bag, he arrives in Pineview claiming to be from the newly restored US government. He convinces town sheriff Briscoe by showing a letter addressed to elderly villager Irene March. The Postman inspires a teenager named Ford Lincoln Mercury and swears him into the postal service. The Postman also meets spouses Abby and Michael, fulfilling their clinical request to impregnate her. When the Postman leaves for the town of Benning, he carries a pile of mail left at the post office door by the townspeople. During a raid of Pineview, General Bethlehem learns of the Postman’s tales of a restored government and becomes afraid of losing power if word spreads. He burns the American flag and post office, kills Michael, kidnaps Abby, and next attacks the town of Benning. The Postman surrenders, but Abby saves him from execution, and the two escape into the surrounding mountains. A pregnant Abby and an injured Postman ride out the winter in an abandoned cabin. When spring arrives, they cross the range and run into a girl, who claims to be a postal carrier. She reveals that Ford Lincoln Mercury organized a postal service based on the Postman's story. They have established communications with other settlements, creating a quasi-society and inadvertently spreading hope. In a recitation of King Henry V's speech prior to the Siege of Harfleur, the Postman rallies himself and his troops to war. The mounted Carriers and Holnists meet across a field. Knowing the casualties will be great if the armies meet in battle, the Postman instead challenges Bethlehem for leadership, with their troops as witnesses. The Postman wins the fight with inspiration from the "Neither snow nor rain" inscription, then offers Bethlehem a chance to build a new, peaceful world. Bethlehem lunges to shoot the Postman but is shot by Colonel Getty, Bethlehem‘s ranking officer. Getty surrenders, and the rest of the Holnists follow. Thirty years later, the Postman's grown daughter speaks at a ceremony unveiling a statue in tribute to her father, who has recently died (1973–2043). The modern clothing and technology show that the Postman's actions have helped rebuild a civilized society. On his personal website, author David Brin reveals that while studios were bidding for The Postman, his wife decided during a screening of Field of Dreams that Kevin Costner should portray The Postman. Brin agreed that the emotions evoked by Field of Dreams matched the message he intended to deliver with his novel. A decade later, after learning Costner would be cast as the lead, Brin said he was "thrilled". Costner discarded the old screenplay (in which the moral message of the novel had been reversed) and hired screenwriter Brian Helgeland; Brin says the two of them "rescued the 'soul' of the central character" and reverted the story's message back to one of hope. In an interview with Metro before filming began, Brin expressed his hope that The Postman would have the "pro-community feel" of Field of Dreams instead of the Mad Max feel of Costner's other post-apocalyptic film Waterworld. Brin said that, unlike typical post-apocalyptic movies that satisfy "little-boy wish fantasies about running amok in a world without rules", the intended moral of The Postman is that "if we lost our civilization, we'd all come to realize how much we missed it, and would realize what a miracle it is simply to get your mail every day." The Postman was filmed in Metaline Falls and Fidalgo Island, Washington; central Oregon; and southern Arizona around Tucson and Nogales. The Postman received heavily negative reviews from critics. Stephen Holden of The New York Times criticized the movie for its "bogus sentimentality" and "mawkish jingoism". Roger Ebert described The Postman as "good-hearted" yet "goofy... and pretentious". However, Ebert recognized the movie as a failed parable, for which he said the viewers "shouldn't blame them for trying". On Siskel & Ebert, Ebert and Gene Siskel gave the film "two thumbs down", with Siskel calling it "Dances with Myself" (in reference to Costner's Oscar-winning film Dances with Wolves) while referring to the bronze statue scene. According to review aggregator Rotten Tomatoes, 3 out of 34 film critics gave the film a positive review, with a "Rotten" score of 9% and an average rating of 3.8/10. Metacritic gives the film a score of 29 out of 100 based on 14 reviews, indicating "generally unfavorable reviews". The film was a notable failure at the box office. The first four days after opening brought in only $5.3 million on 2,207 screens. Produced on an estimated $80 million budget, it returned less than $18 million. The film was subsequently released on VHS and DVD on June 9, 1998, and on Blu-ray Disc on September 8, 2009. ^ "THE POSTMAN (15)". Warner Bros. British Board of Film Classification. January 16, 1998. Retrieved August 31, 2013. ^ a b c Brin, David (December 1998). "The Postman: the Movie". Worlds of David Brin. DavidBrin.com. Retrieved January 27, 2010. ^ Holden, Stephen (December 24, 1997). "Movie Review: The Postman – Neither Snow, Nor Rain, Nor Descent to Anarchy..." The New York Times. Retrieved August 3, 2007. ^ Ebert, Roger (December 25, 1997). "The Postman". Chicago Sun-Times. Retrieved August 3, 2007. ^ "Week of December 27, 1997" (1997). Television: Siskel & Ebert. Burbank: Buena Vista Television. ^ "The Postman (1997)". Rotten Tomatoes. Retrieved February 15, 2018. ^ "The Postman Reviews". Metacritic. Retrieved 15 February 2018. ^ "'Titanic's' Voyage Is Steaming Ahead". Los Angeles Times. Retrieved June 3, 2012. ^ "The Postman (1997)". Box Office Mojo. January 23, 1998. Retrieved January 27, 2010.